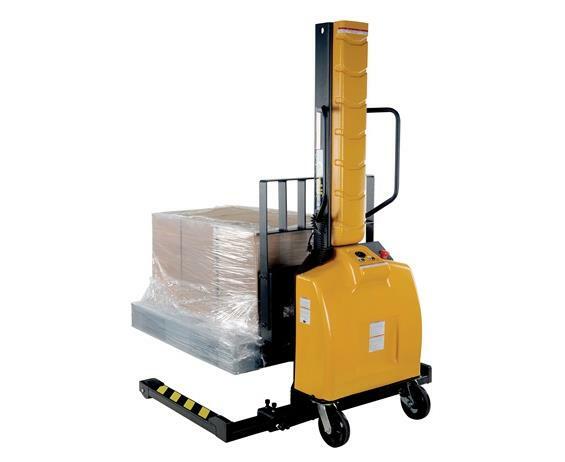 Narrow Mast Stackers With Powered Lift | Morrison Industrial Equipment Co. Narrow Mast Semi-Electric Stackers with Powered Lift will raise and lower loads quickly and easily. Manual push operation stackers are made using high quality material and parts. All models are easily maneuverable using the standard pulling handle. HSLNM stackers are highly efficient and durable. Semi-electric stackers use one (1) 12V battery. Integral battery charger and battery level gauge. FOB Shipping Point. * Uniform capacity at specified raised height.